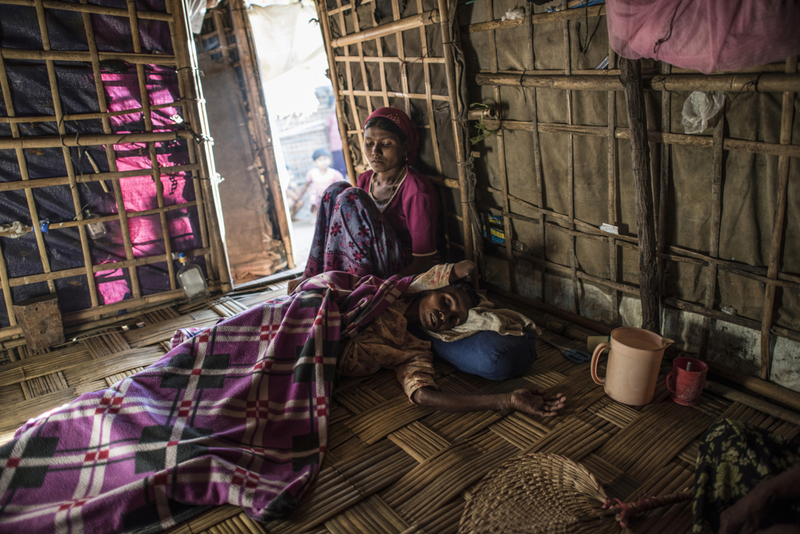 Sumeir, 35, is comforted by her daughter as she lies semi-conscious on the floor of her family's home a few days after surgery at the Sittwe hospital, outside of the Thay Chaung camp, Sittwe, Myanmar, November 24, 2015. For many years, Sumeir suffered from excruciating stomach pain. She went to the That Kay Pyin Emergency hospital within the IDP camp, and was referred to Sittwe hospital, outside of the camp. She was operated on a few days prior in Sittwe, and quickly discharged and returned to the IDP camp at Thay Chaung, allegedly without post-operative care, information about her condition, and without medication for healing. She passed away the morning after this picture was taken. An estimated one million stateless Rohingya have been stripped of their citizenship in Myanmar, and forced to live in modern-day concentration camps, surrounded by government military checkpoints. They are not able to leave, to work outside the camps, do not have access to basic medical care, or food. Most aid groups are banned from entering or working in the camps, leaving the Rohingya to their own devices for sustenance and healthcare. Journalists are also routinely denied access to the Rohingya, Myanmar’s way of ensuring the world doesn’t see the slow, intentional demise of a population.